We welcome runners and walkers of all abilities! Become a member to receive top-notch coaching, a great social atmosphere, and a gang to cheer you on—all while supporting the Ronald McDonald House, which provides care for families when their child has a medical crisis. For this week's workout, click here. Outdoor workouts start April 1st at the Brown Stadium (Sessions St entrance). 6:00 AM warmed up and ready to go from the front of the JCC on Elmgrove Avenue. We welcome runners of all ages and experience levels. Join us and get great training in a supportive atmosphere, all while helping the Ronald McDonald House. 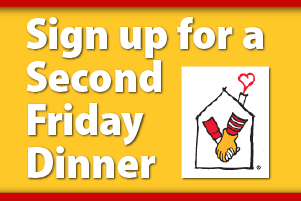 Sign up to bring a meal for a family facing a child’s serious illness. It’s easy—you can sign up well in advance, and you don’t even have to cook. All members wear a Running Club shirt during races to help promote the mission of the Ronald McDonald House. Choose from three great styles! We offer early morning track workouts, a weekly tempo run, a Saturday group run, and an evening run/walk. Find a time and workout that meet your needs. The Ronald McDonald House of Providence is looking for volunteers! Your questions, concerns, comments, and anything we can help you with.